The richest, most decadently thick hot chocolate imaginable. 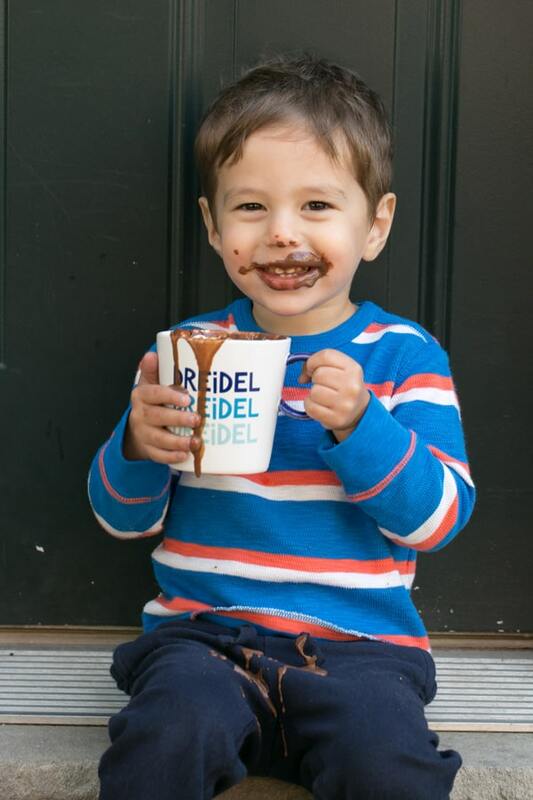 Warm up from the cold with a mug of the ultimate melted chocolate treat! I don’t know about the weather where you are, but here in Philadelphia, I kind of feel like we skipped fall altogether. Last week? In the 70s. Tomorrow? High of 35. Time to dig out the winter coats and hats for the cold walk to preschool and work in the morning! The rapid drop in temperature has me craving all my favorite winter foods, like these cranberry maple pork chops and Italian wedding soup and slow cooker chicken tikka masala. And while it’s not snowing (yet! ), it does have me dreaming ahead to future snow days. Bundling up in winter attire and playing in the snow with my toddler. Followed by the best part: coming in for a steaming hot mug of this decadently thick hot chocolate. Seriously, how better to celebrate a snow day than with the richest, most thick hot chocolate you can imagine? This isn’t your everyday hot chocolate. Stash away a few instant packs at home from that. This is truly thick, decadent, and indulgent. It’s also why I keep some heavy cream in my refrigerator all winter. There is truly no better way to welcome guests into my home than a steaming hot mug of this thick hot chocolate. The first winter after I moved to Philadelphia, my husband and I wandered over to Max Brenner for dessert one evening. We each got an Italian Thick hot chocolate and split a dessert. I have no recollection what we ordered for dessert (a sweet waffle? fondue? dessert pizza? ), but that hot chocolate — it’s the standard to which I have held all other hot chocolate since then. I spent the next winters determined to replicate it at home. Not necessarily the flavor, but the decadently thick texture. I’ve tried it all: adding eggs, a flour roux, evaporated milk, etc. The winning combination? Cornstarch and melted chocolate. Use melted chocolate. You’ll notice I use both melted chocolate and cocoa powder for this recipe. 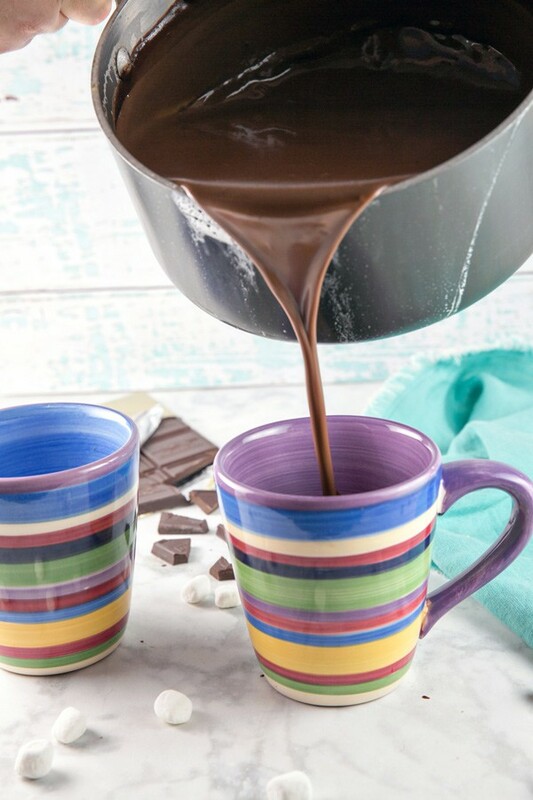 The cocoa powder gives the hot chocolate a super rich chocolate flavor. But the melted chocolate gives this the texture of, well.. drinking liquid chocolate. Because you are. Add extra fat. There are plenty of places in life to cut calories. Eat grilled chicken instead of fried. Steam your veggies instead of sauteeing. But if you want a mug of perfect hot chocolate, this is not the time to skimp. There is both milk -and- heavy cream in this recipe and yes, you should absolutely include the heavy cream. Start with a little cornstarch. No, this does not make it veer too much into a pudding. Trust. Add the cornstarch. Add a pinch of salt. Just a tiny pinch of salt at the end. Nothing makes chocolate taste even more chocolatey than a tiny pinch of salt. Milk? Dark? Semi-sweet? Bittersweet? What kind of chocolate makes the best hot chocolate?! We like our chocolate dark, so I use bittersweet chocolate. If you have more a sweet tooth, use semisweet chocolate. Remember, you can always make hot chocolate sweeter.. but you can’t really go the other way. If you start with bittersweet chocolate and find it’s not quite sweet enough for your taste, stir in a little more sugar. 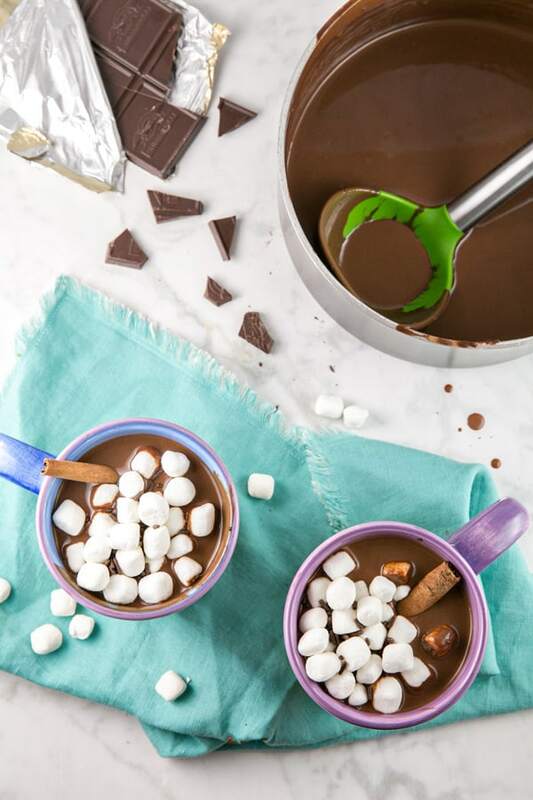 I don’t include any here in this recipe, but consider this your template for all your future hot chocolate adventures. I like mine with marshmallows floating on top and a cinnamon stick to stir around. Cinnamon, nutmeg, and cardamom are all excellent choices (just be sure to actually grab cardamom, because I once accidentally grabbed coriander and… not good). If you want to move in the Mexican hot chocolate direction, add a pinch of chile powder, cayenne pepper, or (my favorite) ground chipotle. Whatever you add, be prepared for the richest, most decadently thick hot chocolate you’ve tried. It’s kind of like drinking a liquid chocolate bar. It’s a total splurge – but it’s worth every last delicious calorie. And of course, serve your hot chocolate with a slice of this hot chocolate bundt cake! Stir together the cornstarch, salt, and powdered sugar in the bottom of a heavy saucepan. Add in milk and cream, and whisk together until cornstarch is fully dissolved. 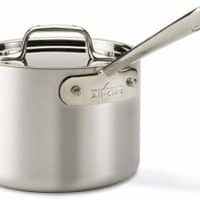 Bring the milk to a boil over medium-high heat, whisking constantly. 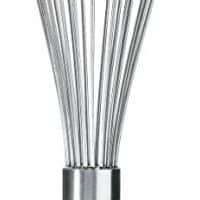 Reduce the heat to low, and continue whisking while the milk simmers for an additional minute. 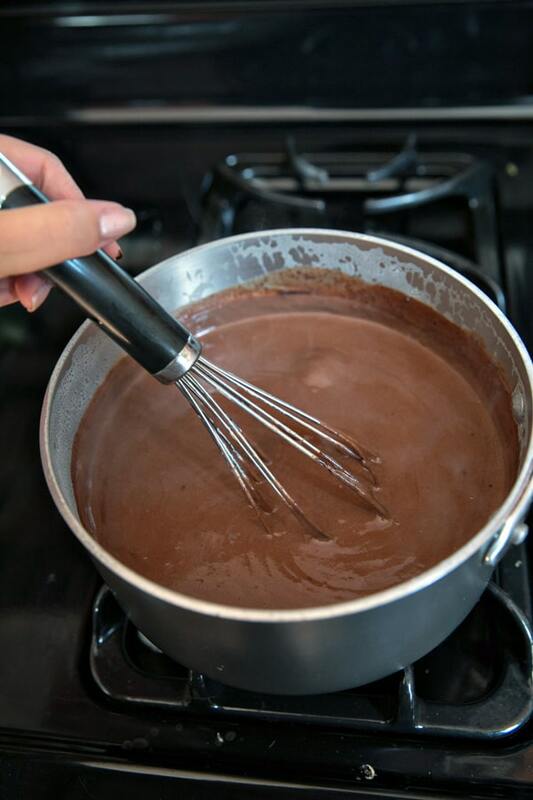 Add the chopped chocolate and whisk until completely melted and smooth. Add in the cocoa powder and vanilla, continuing to stir until all ingredients are incorporated. If hot chocolate is too thick, add a little more milk to thin to desired consistency. 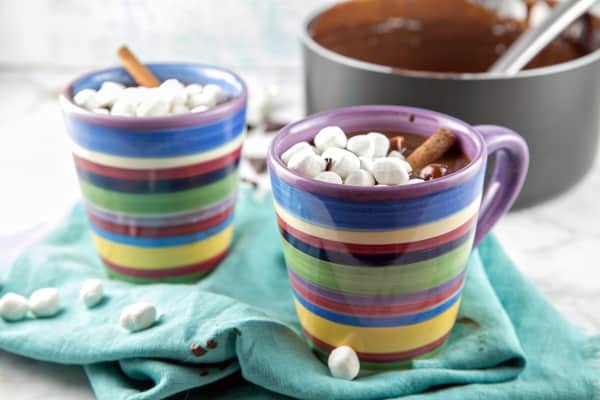 Pour into two large mugs, top with marshmallows, and enjoy! Ive never added cornstarch to my hot chocolate and can’t wait to try it because Im sure that will give it the b best consistency! and ps… I hear you,,, I’m in California…. its still super hot … Im ready for fall too! i will be stocking up on these ingredients this winter! I love thick hot chocolate too! I add cornstarch to my mix too! Turns out so smooth and delish!! 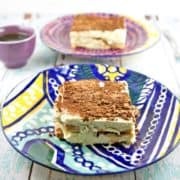 Definitely been looking for a recipe like this! Obsessed with hot chocolate this time of year, and loving that yours is extra thick and creamy. YUM! 35 degrees! Brrr! This looks like just the thing to warm you up! I would love a mug of this for dessert. Yum I love hot chocolate! And I love how yours is so nice and rich. You could practically eat it with a spoon. 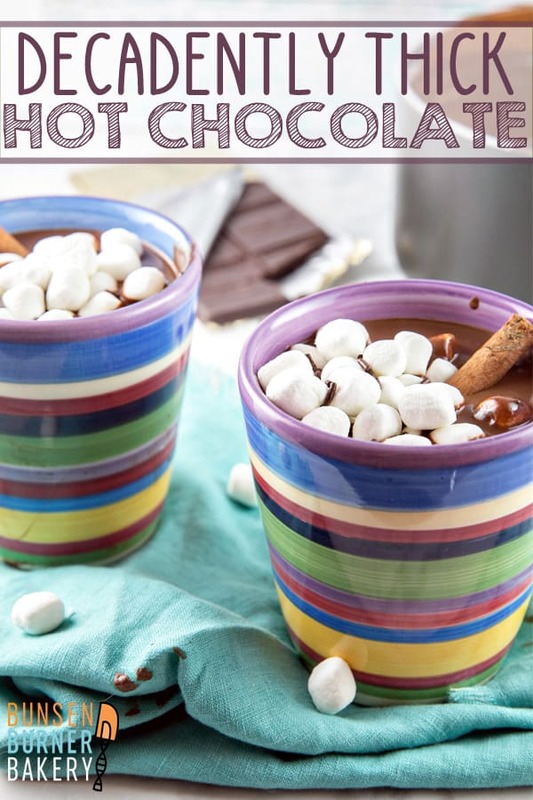 It’s hitting lows of 33 this week so I’m currently rounding up my list of snow day essentials… Well I am the ultimate hot chocolate fan and this just made my list!!! Now all I need is some snow to really get things going…Thanks for sharing! OMG that looks amazing! It looks more like a chocolate sauce! Which, I’m perfect fine with! Just gimme the sauce, please…..
Yess! 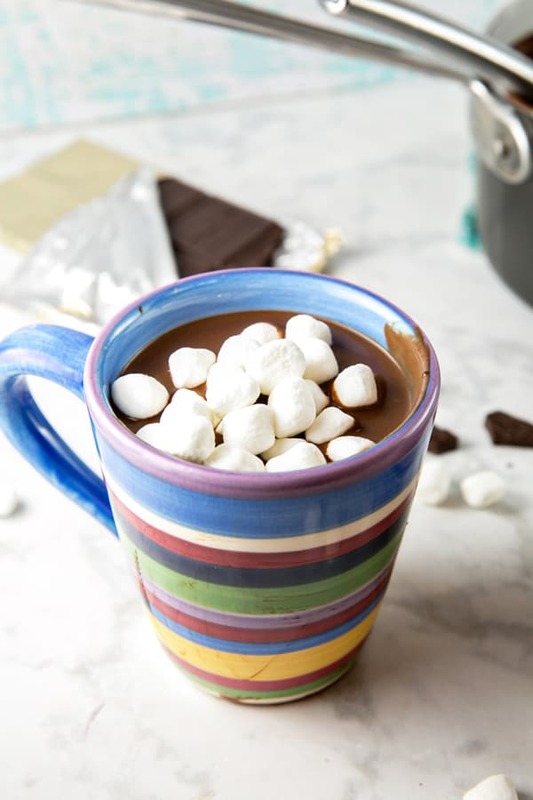 I love making thick hot chocolate like this with cornstarch. We have a cafe near us that serves it…and sells it to make at home for $20 per small canister. Definitely something that can be done at home with the same quality, but much more economically. Great photos! I love the pour shot. That pour shot really shows off how thick the hot chocolate is. Delish! This is what dreams are made of! 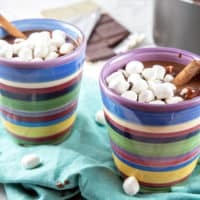 Love the marshmallows on top and can’t wait to make it! 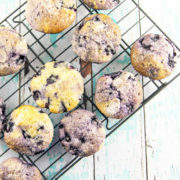 Have you ever tried to make this in a large batch and keep it warm in a crockpot? 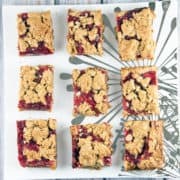 I need to bring a dessert to a potluck and wondered if this would travel well. I haven’t, actually! I think it would work as long as it’s kept warm enough to keep the chocolate melted, but I have not personally tested it.